An example of a thermal map, created on August 9, 2017. The thermal map is limited to the current flow (episode 61g flow), which runs along the center of the map. The blue and green colors correspond to lower surface temperatures, areas of cooled, inactive lava. The orange and red colors show areas of hot, active breakouts on the flow surface. Pāhoehoe lava flows are a common feature on Hawaiian volcanoes, and they have been a serious hazard to residential areas during the Pu‘u ‘Ō‘ō eruption over the past few decades. Pāhoehoe destroyed much of the town of Kalapana, buried most of the Royal Gardens subdivision, and most recently threatened the town of Pāhoa. A challenge with pāhoehoe flows is that they are difficult to track and forecast, in large part owing to how they spread out on the ground. As the surface of a pāhoehoe lava flow cools, lava tubes can develop and transport lava beneath the flow surface. This lava emerges at the active flow front, and on the flow surface in “breakouts” from the tube system. These lava breakouts can occur in many different areas along the length of a flow at any given time. On Kīlauea, lava breakouts are often scattered over areas spanning kilometers (miles). The scattered nature of breakouts is the main challenge for monitoring and forecasting pāhoehoe flows. In some ways, monitoring pāhoehoe flows can be much more difficult than monitoring ‘a‘ā flows, which are often focused in a single, well-defined lava channel. Until recently, geologists at the USGS Hawaiian Volcano Observatory could only effectively map the margins of a pāhoehoe flow. The advance and expansion of the flow margins provided a picture of evolving behavior at the edge of the flow (and potential hazard), but it was difficult to map out exactly where all the breakouts on the flow surface were located. These breakouts are commonly positioned well away from the flow front and margins. Sometimes they advance to reach the flow margins, and drive the flow in a new direction. Knowing where breakouts are clustered, and how they are evolving, is valuable for anticipating where the advance of a pāhoehoe flow might become focused. Over the past few years, HVO geologists developed a new technique to map activity across the entire surface of a pāhoehoe flow. During our routine helicopter overflights, we use a handheld thermal camera to collect a series of overlapping, oblique images along the entire length of the lava flow, from the vent to the ocean entry. We then use “structure-from-motion” computer software to stitch the individual images into a large mosaic. This type of software uses the overlapping images to calculate the exact 3-dimensional position of each image pixel on the surface of the Earth. We insert a handful of known coordinates in the image mosaic as “ground control” points, which provide “georeference” for the mosaic and orients it to its correct position on the Earth’s surface. This mosaic of thermal images is basically a thermal map of the lava flow surface, and reveals the exact location of all the active surface breakouts. The map provides a highly accurate picture of surface activity, improving our ability to anticipate where lava might advance. The added benefit is that we can precisely map the path of the main lava tube, which produces a subtle line of warm temperatures on the surface. Structure-from-motion software has become much more accessible in the past 5-10 years, and geologists around the world use it to make accurate 3D ground surface models. This software is another example of how rapidly technology is changing. 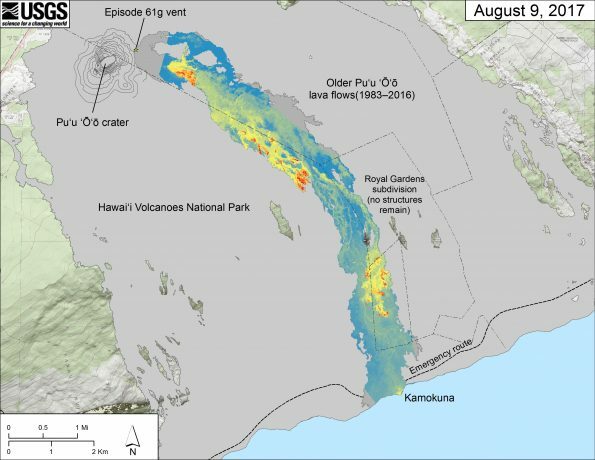 It also shows how new techniques can overcome long-standing challenges and improve our ability to monitor Hawaiian volcanoes.